Fritzi Marie: Fritzi, You're Wanted On The Horn! I owe the universe an apology. I have not been following my own advise and I am annoyed with "me". I'm on a quest to find myself again. I want to be the Fritzi Marie that I used to be. Did I ever tell you where my name came from? My real name is Kathryn Marie but my Daddy never called me by my given name. When I was young, it embarrassed me when my Daddy would holler, "Fritzi, you're wanted on the horn", when a boy would call me on the telephone. I would ask him where got the name Fritzi from and he never had a good answer. It wasn't until after he passed away that I realized that he must have found my nickname from the comic Fritzi Ritz. It totally makes sense, she looks like his type. I'm sorry I haven't been myself lately. I'll be back to my "Fritzi Marie" self soon, I can feel it. p.s. I'm working on our diet blog. 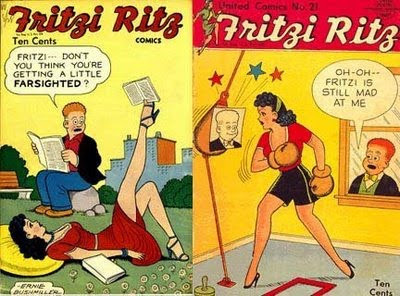 I think it will be named Fritzi's Journey To Becoming A Pin Up Girl. Now if we can just figure out where my name came from! it's funny what embarrasses us when we are young. i love that you have this as your story.